The recording was obtained by the Associated Press and has led investigators to initially suspect that a sonic weapon was used to conduct ongoing attacks, starting last year. The State Department has confirmed that at least 22 Americans have been medically affected. The attacks have caused hearing, cognitive, visual, balance, and sleep problems among the victims. The video released by the AP has been enhanced digitally to reduce background noise and increase volume. The recordings from Havana have been sent for analysis to the U.S. Navy, according to the AP. The Navy did not respond to requests from the AP for comment on the recording. State Department spokeswoman Heather Nauert would also not comment on the tape’s authenticity. Although one individual confirmed hearing the sound, the exact sounds have not been confirmed by every individual impacted by the attacks. There are consistencies, however. Multiple recordings reviewed by the AP from Havana all have variations of the high-pitched sounds. The individuals who heard the noise also confirm generally the noise was consistent with what they heard in Havana. "What it is telling us is the sound is located between about 7,000 kHz and 8,000 kHz. There are about 20 peaks, and they seem to be equally spaced. All these peaks correspond to a different frequency," said Kausik Sarkar, an acoustics expert and engineering professor at The George Washington University who reviewed the recording with the AP. The analysis so far, however, has shone little light on how or if the sound was used as a weapon. 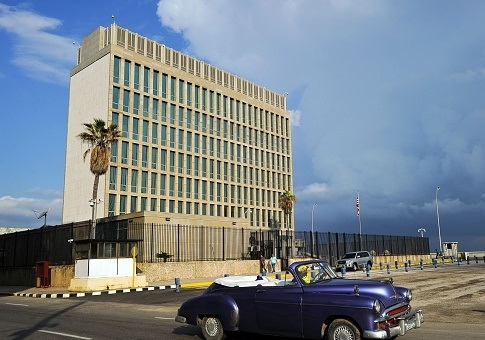 The specific cause of the injuries is yet known to the U.S. Government, and the recordings did not significantly advance the government's understanding of what caused the danger to American diplomats. The recording did appear to rule out the use of high tech weapons, or electromagnetic pulses, as their frequently would be above and below what the human ear can hear. This entry was posted in National Security and tagged Associated Press, Cuba, Navy, State Department. Bookmark the permalink.